I absolutely loved this product. I tried two varieties: Hazelnut Latte and Wild Blueberry Muffin. The Hazelnut Latte variety wins my award for The Best Smelling Oatmeal I've Ever Experienced. You get an idea what you're in for the second you tear open the packet. Even before you add hot water or milk to the packet, you're hit with an aroma that that reminds you of of stepping into a hip, boutique coffee shop. Adding hot liquid to the oatmeal only enhances the olfactory sensation of warm coffee and baked goods. And the taste? Do you remember the old York Peppermint Pattie commercials where a person would bite into a pattie and suddenly be transported to a chilly mountain top? 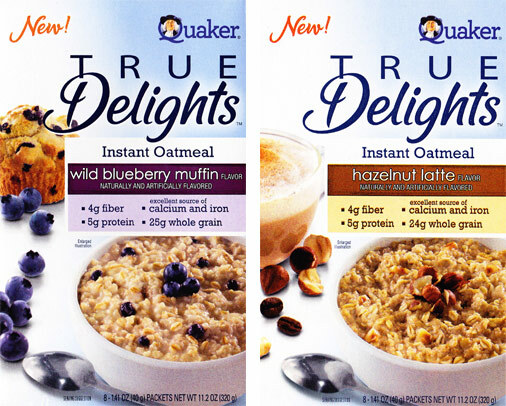 Well, it might not seem as dramatic, but when I bite into a bowl of True Delights Hazelnut Latte Oatmeal, I suddenly feel like I'm at... my local Starbucks or Coffee Bean coffee shop. In short, the taste is delicious. The flavor of "hazelnut latte" is nutty, almost carmel-like with a near-chocolate undertone. If you're familiar with the drink, it does taste very much like a Hazelnut Latte. To make matters better, the texture of this oatmeal is a step above most. In every other bite, you're greeted by the light, tender crunch of a real hazelnut piece. The thing I like best about this oatmeal is the potential it alludes to. With all the flavors of oatmeal available, this new hazelnut latte flavor shows there's still room for more. Other coffee shop flavors come to mind: Caramel Frappuccino, Cherry Chai Macchiato, Oatnut Scone, White Chocolate Mocha Cappuccino, etc. It's exciting to think our old friend oatmeal might still be growing, maturing to keep with the times. An oatmeal that tastes great and could be a sign of a more exciting future? I'll have another box of that please. The Wild Blueberry Muffin variety is also fantastic. It's not a bowl-you-over flavor innovation like its partner, but it's nearly as delicious. There's a distinct authentic blueberry flavor throughout the product and in almost every spoonful there's at least one tiny wild blueberry to give a little extra burst of real blueberry flavor. My only complaint is that the blueberries stay slightly firm in the prepared oatmeal. This is a very minor beef. If the berries reconstituted to an authentic blueberry texture, this oatmeal would be very close to perfect. Nutritional considerations: Each single packet servings contains 150 calories. The blueberry version has 2 grams total fat and the hazelnut version has 2.5 grams total fat. Both varieties have 0.5 grams saturated fat and 0 trans fat. Both contain 4 grams of dietary fiber, 9 grams of sugars and 5 grams of protein. 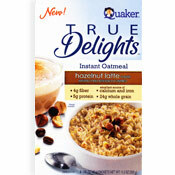 What do you think of True Delights Instant Oatmeal? The hazelnut has a stale nut taste and is horrible. The blueberry on the other hand is great. It is a staple in the house. I can't find the blueberry muffin oatmeal in Az anymore & it's listed to be in the Target stores but it's not. Why? I cannot find this product in AZ. I loved the Hazelnut Latte but can't find it anymore. Prices online are triple. First time I enjoyed oatmeal and it disappears off the shelf. I finally picked up the wild blueberry muffin today. I put some real blueberries in the mix to see if I could tell the difference. While the texture was a dead giveaway, the flavor between the packaged blueberries and the real ones were pretty close. I was quite surprised actually. While the aroma of the hazelnut latte is very enticing, I feel the wild blueberry muffin is the better of the two overall. I finally picked up the Hazelnut Latte at Target. I'm not a coffee drinker so I didn't have anything to compare it to. The hazelnut flavor was pretty good but I thought the oatmeal was just a tad too sweet. It's tasty though and I would definitely buy it again. I want to try the blueberry one. It seems like most people on here like that one more. I agree with Madelyn above - where is it?? I tried it from a friend in my office, and I have been all over the city trying to find a store that carries it? Is it too new? I hate oatmeal!! But when I tried this product (Blueberry) I went back to the store grabbed more. The taste, texture of the oatmeal is fantastic. Not to mentioned the aroma it is just inviting. I love this line of oatmeal and now I can't find it in the store. What happened to it? I finally found a line of oatmeal that I like and now it's gone. Can you tell me what happened to it? I personally do not like the hazelnut latte. I had big clumps in every bag and my hazelnuts tasted stale or rotten. It had a strange "rotten peanut" like aftertaste. The blueberry is a really amazing flavor... really tastes like blueberry muffins. I was skeptical about the idea of "coffee-themed" oatmeal, but I have to admit that this stuff is good. Top it with some chocolate-laced granola and some nice, thick vanilla yogurt, and the taste value triples. This is hands down the best instant oatmeal I've ever had. The taste is wonderful (just like a hazelnut latte from starbucks!) and the crunch of the hazelnut pieces adds great texture. I've always loved oatmeal, and this definitely is my favorite!! I've tried both the hazelnut and the blueberry. Although being an oatmeal and coffee lover, something about the hazelnut kind did not sit right with me. Tastes funny, bland, just not my thing. The blueberry kind was pretty good, not the best but good. A little too sweet for my taste. If you let it sit and thicken for a little bit the blueberries do become softer but not like fresh blueberries. Agreed! The Hazelnut Latte flavor is so delicious and it makes a great breakfast as well as a healthy snack. I have to try this. I have been looking for a good oatmeal lately since a bowl of it helps me fall asleep at night. 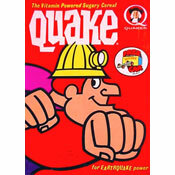 I've been eating the traditional Quaker Instant but I've been scouting for something new. I'm definitely going to give these two a try. I'm not sure I would like the hazelnut one but I'll still try it.